art and culture of the Celts. All pendants come to you in a lovely suedette pouch. A beautiful 'Gypsy' style triquetra pendant, 2mm thick, smoothe seamless lines, flat backed with a very solid jump ring to hang on your chain. This pendant is well made and suitable for both men and women. 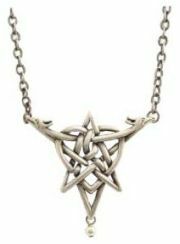 A stunning and complex design this necklace layers a heart, pentagram, triquetra and Celtic dragons interwoven into one Celtic knot. This unusual piece is finished with a small pearl bead at its base. The chain has a spring ring clasp and 5cm extension. 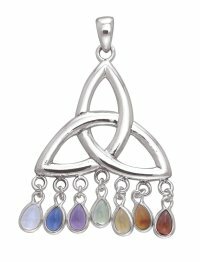 Cleverly fashioned of sterling silver, this necklace charm presents three Triquetras. Each is strung beneath the other by small lengths of chain, with each Triquetra below being smaller than the one above. Hanging approximately 3" in length, this charm does not come with a chain, but does include a slider bail that allows it to be strung upon any cord or chain that you desire. 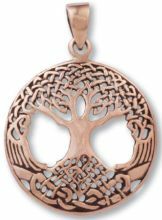 Ancient Celts (Druids) believed that the Tree of Life or crann bethadh, possessed special powers such as wisdom, strength and longevity. It symbolises the forces of nature coming together in perfect harmony to maintain the balance in the universe. 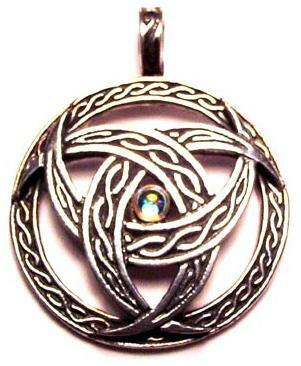 A beautiful and detailed pendant with pierced celtic knotwork design. 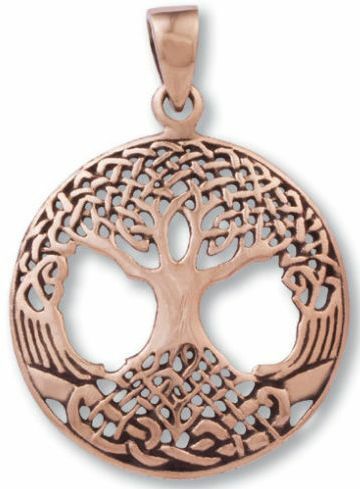 The Tree of Life is a mystical and magical tree well known throughout many cultures. Different races and religions call it by different names - each having its own Tree of Life in their mythologies with similar meanings as the source of life. 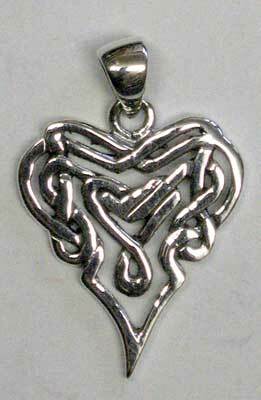 Beautiful celtic knotwork heart with special 'Slider' Bail for your chain. This pendant features a dangling 20mm chain holding teardrop stone - available with 4mm Moonstone Cabachon or 5mm Faceted Emerald Green Stone. This pendant consists of Celtic knotwork that weaves in and out of itself until it forms this magnificent piece of sterling silver jewellery. 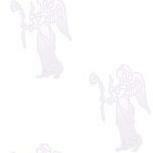 Delicately sized at 3/4" x 3/4". This Celtic pendant is double sided and peirced. Our pendant has a twisted swirl bail (photo shows plain bail). This beautiful heart pendant features eternal woven knotwork. Design by celtic artist, Courtney Davis. Celebrate the spirit of Celtic history and myth. Now the energy of Courtney Davis designs have been transformed into shimmering Sterling Silver. This rectangular Celtic pendant has pierced knotwork for a three dimensional effect and behind the silver knotwork is antiqued for an aged look. 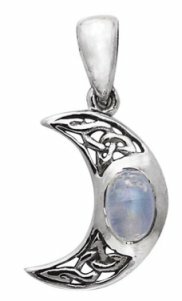 A beatiful crescent Moon pendant with pierced celtic knotwork, features an oval 4x6mm central stone. Choose from Moonstone cabachon or faceted Amethyst stone. 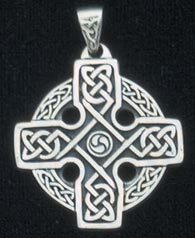 A traditional Circular Celtic Cross design with detailed knotwork. Silver bail features knotwork detail. This is a heavy solid pendant. 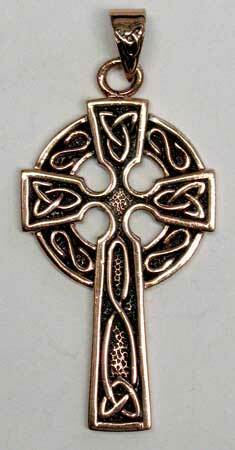 A traditional Celtic Cross design with raised knotwork. Its antiqued finish adds a rustic effect. This pendant is detailed with celtic knotwork also on the bail. Limited Availability. This is an unusual 3-dimensional pentagram pendant. Celtic knotwork surrounds the pentagram in circle on the front and back of this double sided pendant. Its shapes is spherical and features two pentagrams in circle. Also Suitable to add to magickal tools. Pentagram in circle surrouned by a knotwork border. 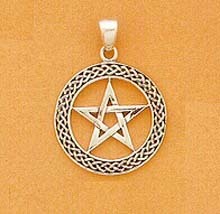 A circle border of celtic knotwork surrounds the pentagram in circle with a central swirl. Hidden behind this pendant is a fixed bail for chain. A beautiful solid pendant featuring a 5mm dia faceted stone - choose from Amethyst or Blue Topaz. The silver bail on this pendant has celtic knotwork detail. Lots of silver in this piece. 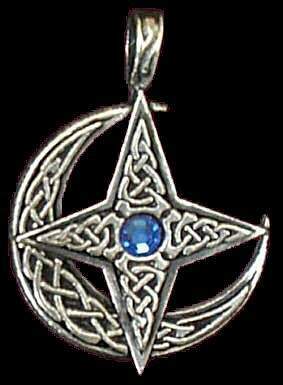 A Pentagram in circle with celtic knotwork and tear drop stone inlay. The pentagram is laying over the knotwork for a 3-dimensional effect. Choose from Black Onyx, Malachite or Lapis Lazuli stone. Very Nice detail. Choose Your Stone Inlay. Available with Black Onyx, Malachite or Lapis Lazuli. A nice Pewter Celtic Weave Triple Crescent Moon pendant with a fixed bail. The centre of this pendant holds a glowing 4mm crystal. The triple crescent moons are raised from the circle backing on this pendant for a 3-dimensional look. The earth star, symbol of the Goddess Nerthus in conjunction with Mani the moon symbol of magic, reason and measured change. This design is inspired by the tribes of the North. Features a deep Blue faceted Swarvoski Crystal and fixed bail. Sturdy lead-free pewter Celtic diffuser locket pendant comes on strong rhodium chain and five replaceable diffuser pads. Wear as a necklace, or you can hang it as an air freshener. Represents 'Luck' - May The Luck Of The Irish Be Yours! The Shamrock, an emblem of Ireland, known for its healing properties and a traditional icon of St Patricks Day. The Shamrock plant was revered by Saint Patrick to illustrate the doctrine of the Trinity. He used it in his sermons to represent how the Father, the Son, and the Holy Spirit could all exist as separate elements of the same entity. St. Patrick's Day takes place just a few days before the first day of spring. One might say it has become the first green of spring. A delightful Celtic Shamrock pendant in Sterling Silver, featuring Green Enamel inlay on each leaf. 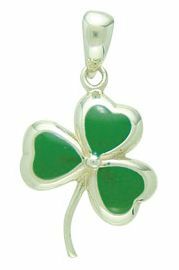 A shimmering silver Shamrock pendant features a 4mm Emerald Green faceted stone in a claw setting. The Celtic Trinity Knot or the Triquetra, is one of the most common of the knot ilk. 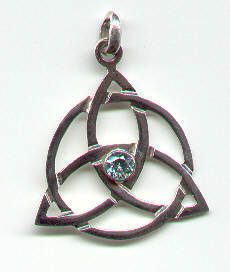 The term Triquetra comes from Latin, and means "three-cornered." 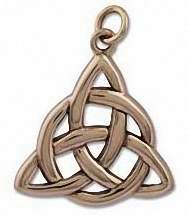 There are many beliefs regarding the Celtic Trinity Knot meaning. All of the various interpretations agree on a culmination of three parts. Early Christian understanding views the symbols as the Father, Son and Holy Spirit. Whereas, a more pagan school of thought sees the trinity knot as the drawing of the three inherent feminine powers: Mother, Crone, and Maiden. Another belief can be found in a more metaphysical arena where the three corners represent mind, body and spirit. A stunning Trinity Knot pendant with 7 dangle cabachon stones offering a broad spectrum of colour. Each teardrop stone measures 5mm - Amethyst, Perido, Rainbow Moonstone, Saphire, Citrine, Amber and Garnet. Each item crafted by ShadowSmith bears the mark of the artist - a Runic s Lightning bolt. Only a ShadowSmith original bears this symbol. 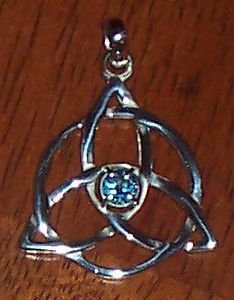 Sterling Silver Triquetra symbol pendant.